What Has Gotten Into The Water Over At IPWatchdog.com? Gene Quinn, along with his site IPWatchdog.com, has been a stalwart defender of the current patent system. The honest impression that I have gotten in the past while reading his posts is that he has elevated the importance of the patent industry (and the economic benefits it has given to a discreet class) over actual innovation. Regular readers of this site might recall him being singled out by Stephan Kinsella [ http://www.againstmonopoly.org/index.php?perm=593056000000001821]. http://ipwatchdog.com/2010/12/08/copyright-trolls-the-meaner-stepsister-of-patent-trolls/id=13695/ (This post is admittedly written by a guest to Quinn's site, but it is still nice to find him hosting such views). I don't want to make too much of this. I (and I suspect other contributors to this site) still have profound disagreements with Quinn's perspective. But it nonetheless seems to mark something of a positive shift in thinking, or at least rhetorical emphasis. Even if it turns out to be slight, it is still a positive development which I welcome. A simple recognition of the harm that patent trolls cause shouldn't be difficult to admit to - even for those who are stalwart supporters of the remaining aspects of our current patent system. It is somewhat amusing to see his commentators accuse him of going over to the "dark side" and espousing "pure, unabashed anti-patent rhetoric", and then read Quinn having to defend even this reasonable and narrowly-tailored critique which he has authored. Quinn himself admits: "I know that over the last several years I have not been one to want to jump up and down over the problems created by patent trolls..."
I hope that this will mark the opening of a more constructive dialogue. If these posts of his are any indication, then we actually share the same broad goal of maximizing innovation. Before now, I honestly wasn't sure he placed that goal as the prime directive. True "innovation" can't be thought of merely as the creation of a new invention, but rather, the placement of that new invention into the hands of wider society. There is no actual innovation until the practical benefits of an invention are widely disseminated for use by the general public (or as large a group as the nature of an invention practically allows for) which in turn allows them to build further on it. I don't wish to start a philosophical conundrum akin to the question of "does a tree falling in a forest make a sound if nobody is there to hear it?" But from my perspective, a ground-breaking invention is not "innovation" if it is kept under wraps by a small secret society or elite oligarchy. The term "innovation" inherently connotes the fact that its benefits are shared by as much of the public as practically possible. The next step is debating what system would maximize that. The gulf in views are still vast, but if we can agree on what "innovation" actually means and can also agree that maximizing it should be the primary goal IP regimes (as opposed to placing economic considerations for certain IP players as a primary end unto themselves), then we will be well on our way towards a more constructive dialogue. From a representative of a large multinational to the inventor of graphene: "We are looking at graphene, and it might have a future in the long term. If after ten years we find it's really as good as it promises, we will put a hundred patent lawyers on it to write a hundred patents a day, and you will spend the rest of your life, and the gross domestic product of your little island, suing us." A great line from the new film The Social Network. Lawrence Lessig gives a very insightful review of the film and explains how, in spite of it still being a solid film, writer Aaron Sorkin managed to miss the mark in crafting an even better (and ultimately, more honest) one. While we ponder the future of intellectual property with our focus mainly on the encouragement of its creation, we also need to think about collecting it, preservating it, accessing it, and reproducing it for wider distribution. Jonathan Shaw writes about these matters in Harvard Magazine in the context of libraries at Harvard University and in libraries more generally link here and here and here. The focus is on libraries, but Shaw draws connections as well to the internet, Google's digitizing of books, to how librarians have become experts in finding access to relevant material through many media, and of the need for specialization as knowledge has become more complex and extensive. It seems to me that without saying so explicitly, the article constitutes a powerful argument for making information as freely and cheaply available as possible. It also provides examples of how this is already being done. Innovation is clearly taking place here, and IP law needs to get out of the way. Via Michelle Geis, Uber-blogger Andrew Sullivan gets on board with links to a new report in Genetics in Medicine suggesting that "exclusive licensing of gene patents does more to block competition and decrease patients' access to testing than it does to spur innovation." The brilliantly innovative band OK Go has decided to leave its label, EMI, and and starting up its own company, Paracadute Recordings. The band's Damian Kulash explains why in a fascinating interview with Leo Laport on TWIT. This presages the direction a lot of creators and artists will start to take as they leave the copyright-mired Old Media Dinosaurs behind. Copyright control extends not just to verbatim copies, but to "derivative works." This has led to censorship on a grand scale. For example, the seminal German silent film "Nosferatu" was deemed a derivative work of "Dracula" and courts ordered all copies destroyed. Shortly before his death, author J.D. Salinger convinced U.S. courts to censor another author who transformed his characters. And so on. The whole history of human culture evolves through copying, making tiny transformations (sometimes called "errors") with each replication. Copying is the engine of cultural progress. It is not "stealing." It is, in fact, quite beautiful, and leads to a cultural diversity that inspires awe. I recently read "Against Intellectual Property" and liked it very much. It reminded me of some things I've written: Intellectual Property is Slavery and Redefining Property: Lessons from American History; also My Official Position on Copyright. I especially enjoyed your unique twist on Trademark, that trademark suits should be brought by consumers against frauds, rather than by trademark "owners." I haven't thought it all through to form my own solid opinion yet, but I like the novel approach. Anyway, thanks for the good book, I'm recommending it to my Free Culture buddies. What drives innovation? How does it contribute to the growth of firms, industries, and economies? And do intellectual property rights help or hurt innovation and growth? Uniquely combining microeconomics, macroeconomics, and theory with empirical analysis drawn from the United States and Europe, this book introduces graduate students and advanced undergraduates to the complex process of innovation. By addressing all the major dimensions of innovation in a single text, Christine Greenhalgh and Mark Rogers are able to show how outcomes at the microlevel feed through to the macro-outcomes that in turn determine personal incomes and job opportunities. From a quick skim of ch. 1 (available here), it appears to adopt a mainstream approach--finding out whether there is market failure or a public goods problem (see Hans-Hermann Hoppe's "Fallacies of the Public Goods Theory and the Production of Security," in The Economics and Ethics of Private Property for criticism of the concept of "public goods"), and then asking whether we can fix it with some kind of state invervention. The same old "the market is not perfect, so let's let the thugs with guns have more power" song and dance. 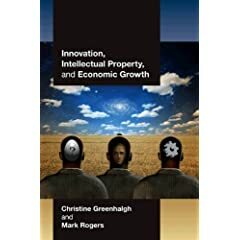 In addition, understanding whether these monopoly costs of IPRs [intellectual property rights] are less than the benefit to society emanating from the spur that IPRs give to innovation will provide a major theme for parts II and IV of this book. My guess: they'll conclude that some IPRs can help address the market failure/public goods issues and give rise to some kind of net benefit, but not our current IP system; so then we'll have a laundry list of "reforms" that would tweak the current laws to reduce the cost enough so that there is a net benefit. Just a hunch. Unfortunately, at $45 even in e-book format, I don't think I'll read it until it comes out at a more reasonable price.